She whirs, she purrs, and she’s just so darned cute! In just the last couple of weeks both M and I have fallen in love with her. Though the jury’s still out on her name, she’s always right there when we need her, providing comfort and reducing stress. She looks good in every color, but especially those that compliment red. Put anything soft near her, and she’s bound to make it something beautiful…. Oh, and did I mention she’s a bug? Aahhhhhh, my pretty little ladybug. I brought her home the day after my first spinning class, where we fell in love. Sure, I tried a couple other wheels out, but when I spun with her, I knew it was meant to be. 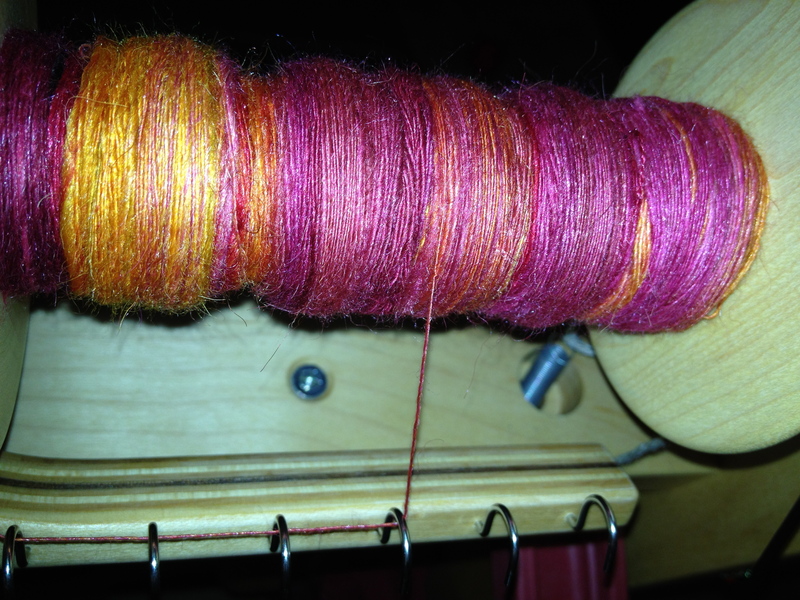 Since April 10th I have spun and Navaho plied 2 oz. of merino from KnittyandColor into a (mainly) sport weight 3ply yarn. 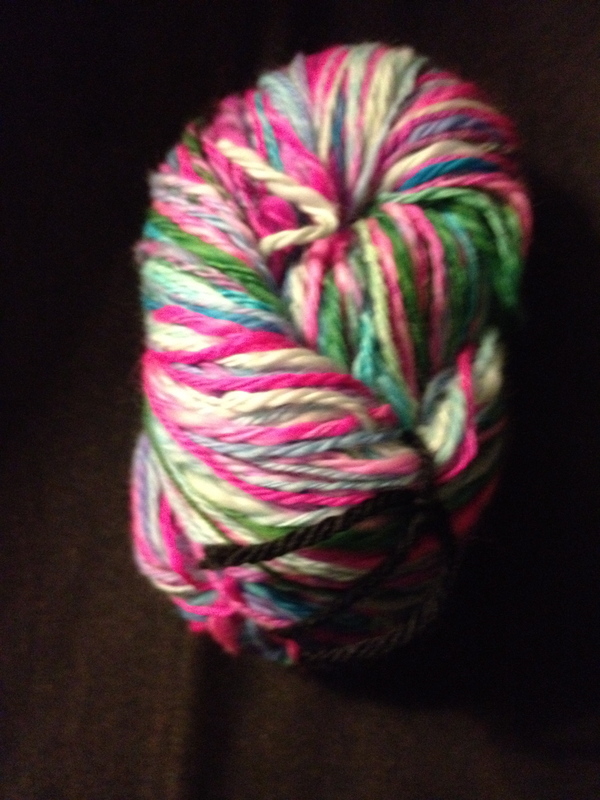 2 oz of KnittyandColor Merino in the "Make Me Pretty" colorway. 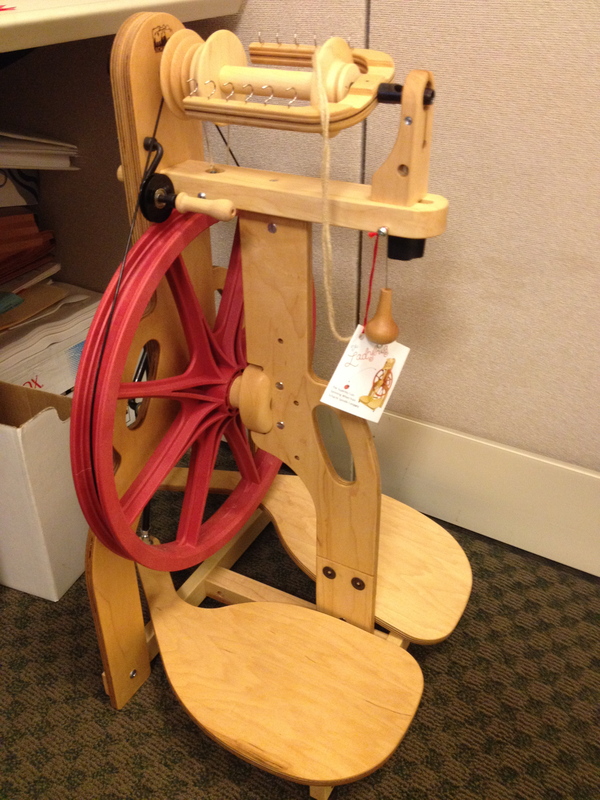 That’s right, I said I Navaho plied… my first wheel-spun yarn, was Navaho plied. I wanted the colors to really keep their integrity, get the “challenging” plying technique learned and out of the way… and really, I just couldn’t wait to finish spinning the second bobbin before plying the first. I was too excited! Now I’m on to a Frabjous Fibers “Opulence Blend” of superfine merino, tussah silk, baby camel down, and royal baby alpaca. Clearly I like to challenge myself right away… Though the merino and silk have a nice staple length, I occasionally run into a clump of just baby camel down. We maybe in a fight, and the baby camel is winning. That being said, generally, this is spinning up very nicely and also pretty thin and is likely to be a two ply when I’m done with it. 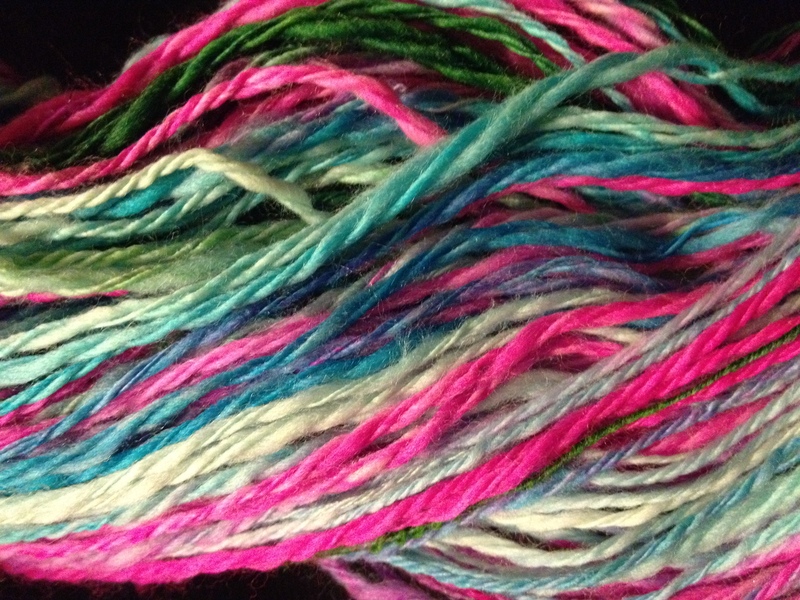 Frabjous Fibers "Opulence Blend" in the Moulin Rouge colorway. I am slowly making my way through my fiber stash, practicing as much as I can so that I am prepared to spin the pound and a half of magenta fiber into a yarn suitable for a sweater for M. So maybe by the fall? …of 2013?